Jennifer Egan's spellbinding interlocking narratives circle the lives of Bennie Salazar, an aging former rocker and record executive, and Sasha, the passionate, troubled young woman he employs. Although Bennie and Sasha never discover each other's pasts, the reader does, in intimate detail, along with the secret lives of a host of other characters whose paths intersect theirs, over many years, in locales as varied as New York, San Francisco, Naples, and Africa. We first meet Sasha in her mid-thirties, on her therapist's couch in New York City, confronting her long-standing compulsion to steal. Later, we learn the genesis of her turmoil when we see her as the child of a violent marriage, then as a runaway living in Naples, then as a college student trying to aver the suicidal impulses of her best friend. We plunge into the hidden yearnings and disappointments of her uncle, an art historian stuck in a dead marriage, who travels to Naples to extract Sasha from the city's demimonde and experiences an epiphany of his own whilst starting at a sculpture of Orpheus and Eurydice in the Museo Nationale. We meed Bennie Salazar at the melancholy nadir of his adult life - divorced, struggling to connect with his nine-year-old son, listening to a washed-up band in the basement of a suburban house - and then revisit him in 1979, at the height of his youth, shy and tender, reveling in San Francisco's punk scene as he discovers his ardor for rock and roll and his gift for spotting talent. We learn what became of his high school gang - who thrived and faltered - and we encounter Lou Kline, Bennie's catastrophically careless mentor, along with the lovers and children left behind in the wake of Lou's far-flung sexual conquests and meteoric rise and fall. A Visit from the Goon Squad is a book about the interplay of time and music, about survival, about the stirrings and transformations set inexorably in motion by even the most passing conjunction of our fates. In a breathtaking array of styles and tones ranging from tragedy to satire to PowerPoint, Egan captures the undertone of self-destruction that we all must either master or succumb to; the basic human hunger for redemption, and the universal tendency to reach for both - and escape the merciless progress of time - in the transporting realms of art and music. Sly, startling, exhilarating work from one of our boldest writers. With inside cover copy like that, and the fact that this is the book that won the Pulitzer prize and others, and was longlisted for the Orange Prize as well, who needs a review! When I look back on this book in a couple of years time I think the thing that will still be strong in my memory is the structure of the book - if you could call it structure as such. It isn't a novel as much as it is an interlocking collection of short stories. This isn't a book that goes from point A to point B. It probably starts at point G and eventually gets to point Z with side trips past point A and B. In my own mind I was trying to think of a comparison to show how this book works and the closest I could come up with was one of those puzzles we used to have as kids where there was a mixed up picture in a square and there was one piece missing so you had to move all the pieces around until the picture was formed. At first you would get occasional glimpses of what the jumbled image was going to look like, but then you would have to break the picture up to make another piece of the puzzle fit. Eventually though, the last piece slides into place and you see the whole image. Another analogy might be a really long conversation with a very good friend, where you jump topics with ease, reminiscing about the past, talking about the future, and sharing a joke. Never a linear conversation but rather one that starts at one point, and then ends up somewhere completely different and you find yourself wondering how you got there! Another aspect of structure that was very different in this book is that Egan experiments with all different forms of storytelling. There are chapters written in the form of a magazine column, another in Powerpoint as well as different tenses and points of view. I think the Powerpoint chapter was amazing! The language was sparse, the story barely there on the page, but the concepts and the narrative were still strong enough to be clear for the reader, and I loved that we got to see Sasha's future life. After looking at the structure, how about the characters. I can't say that I particularly related to the characters that we met in the pages of the book, but such is Egan's skill that you actually didn't need to. Our two main characters are Sasha and Bennie. Sasha is on a date with Alex when her habit of stealing things, anything, causes her to steal a wallet whilst in the bathroom. As she analyses why she steals with her shrink, Alex crosses one of her boundaries without even knowing it. We meet Sasha again as a young woman struggling to make ends meet living as a runaway in Naples, and then through the eyes of her best friend Rob who has plenty of demons of his own. In the next chapter we meet Bennie, who is Alex's boss. He is a divorced man who is struggling to relate to his 9 year old son. One way that he can occasionally connect is through music, but even that is problematical. Through the book we see Benny with his ex wife in happier times, then we meet him as a youth revelling in the punk rock scene with his friends. We meet his mentor Lou and his very young girlfriend and her friend. The links as we move from chapter to chapter are at times tenuous, but they are all there for a reason. Along the way, Egan makes comment about some important issues. Not only the power of music to transcend time, but also for example the power of media when a washed up PR person is employed to try and rehabilitate the image of an African dictator. Another chapter that I really liked, not because it was enjoyable but because of the food for thought it provided, was the final chapter. It is set in New York in the not too distant future and Egan has taken our current obsession with social media and expanded it to the nth degree to come up with a quite scary world where even the youngest child has exposure to the media in a way that is similar to our own world but amplified many times over. A washed up musician is being bought back for a live concert and one of our characters is being asked to find some parrots - people who can spread the word, hype up the event to make it a success, to make it the kind of event that everyone who is anyone will claim to have been at even if they really aren't. In a way it kind of reminded me of a discussion of the difference between buzz and hype and how one, or the other, is generated, whether it is organic or whether there is someone in the background pulling the strings to manipulate the public. 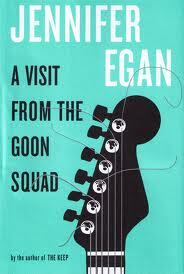 This is the second Egan book I have read and liked. A few years ago now I read The Keep which was a kind of modern, gothicky ghost story. I am not sure why I haven't bothered to go and track down her other books. I will definitely be watching to see what the author comes up with next as she doesn't seem to be afraid to take risks in her writing and to take her readers on the journey with her! I loved this book, and think that you did it great justice in your review. Usually books that don't follow a linear progression scare me, but for some reason, this book really worked for me in a huge way. It was really such a wonderful read, and it's something that I would love to read again sometime. Glad to hear that you loved it too, and thanks for sharing your amazing review! I have tried to get into this book a couple times now and still not succeeded. I think that is an Egan trait, though. I started The Keep not expecting to enjoy it and wound up loving it. I will just have to try again with this one. Very nice review, Marg. I'm glad you finally got around to reading this one. I think I remember seeing it in your library loot months ago. I had been looking for it at my library at the same time and there was a huge holds list for it, so I never bothered putting my name on the list. I should look into it again. This book was really hard for me. We read it for book club and the stories were so barely interconnected that I had a hard time following. I am glad that I read it for book club so they could explian it to me! Beth, she is definitely an interesting author in terms of the choices she makes. Shannon, I always intend to read the prize winners too. Usually the one that works best for me are the Orange Prize winners. Amused, it was hard to see the connection between the stories at times. Christine, I like it when there is a long queue. Just wait for it to finally turn up and then read it then! Kailana, I think you are right because The Keep did take a while to get going too. Thanks Zibilee! I seem to have a bit of reviewing mojo at the moment - at the expense of reading mojo I have to say, so I have been writing quite a few reviews. Hmmm...another positive review. It seems this is a book that either is loved or not loved. I'm not sure yet if I will read it but your review has me leaning (once again) to the read it side!! Great minds think alike, Marg, I just posted a review of this one as well. I loved it, too. I really liked your comparisons, that's a very good way to describe the book. I just downloaded the audiobook from the library and now I'm really curious to see how it translates to audio format. And after reading your review it makes more sense why the audio download also came with the eBook as an enhancement. "Never a linear conversation but rather one that starts at one point, and then ends up somewhere completely different and you find yourself wondering how you got there!" One of my favourite things: when novels take that circular-ness resplendent in good (and oh-so comfortable) conversations and put it on the page for us. You've done a great job of capturing the power of this novel without revealing anything that will spoil any of it for readers coming to it for the first time. I didn't have much success with this book, but then I read it when I was going through a slump. I wonder how I would feel about it now. Definitely deserves a visit. Glad you liked it.